A camera that codes exposure time with a binary pseudo-sequence to deconvolve and remove motion blur in textured backgrounds and partial occluders. 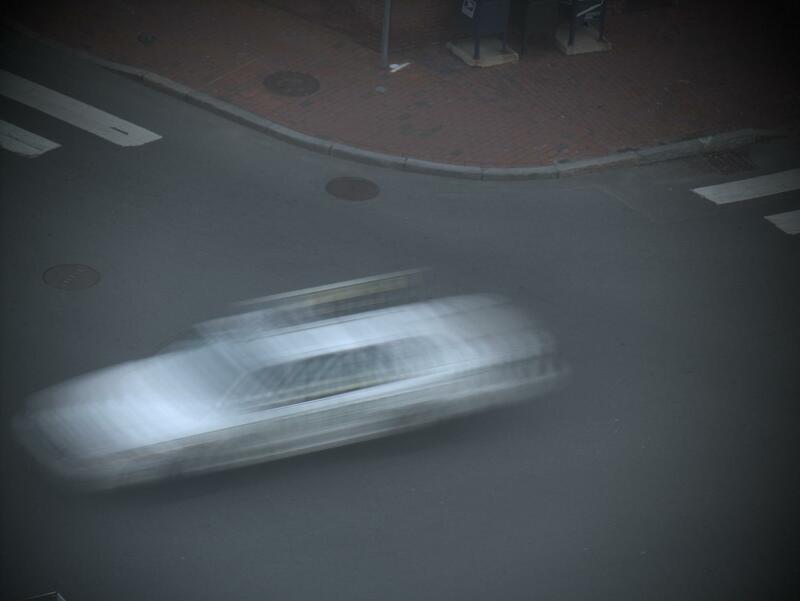 In a conventional single-exposure photograph, moving objects or moving cameras cause motion blur. The exposure time defines a temporal box filter that smears the moving object across the image by convolution. This box filter destroys important high-frequency spatial details so that deblurring via deconvolution becomes an ill-posed problem. Rather than leaving the shutter open for the entire exposure duration, we “flutter” the camera’s shutter open and closed during the chosen exposure time with a binary pseudo-random sequence. 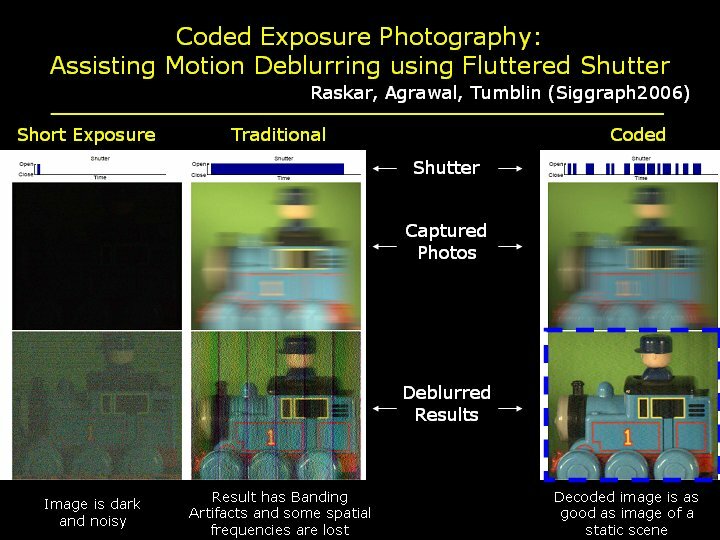 The flutter changes the box filter to a broad-band filter that preserves high-frequency spatial details in the blurred image and the corresponding deconvolution becomes a well-posed problem. 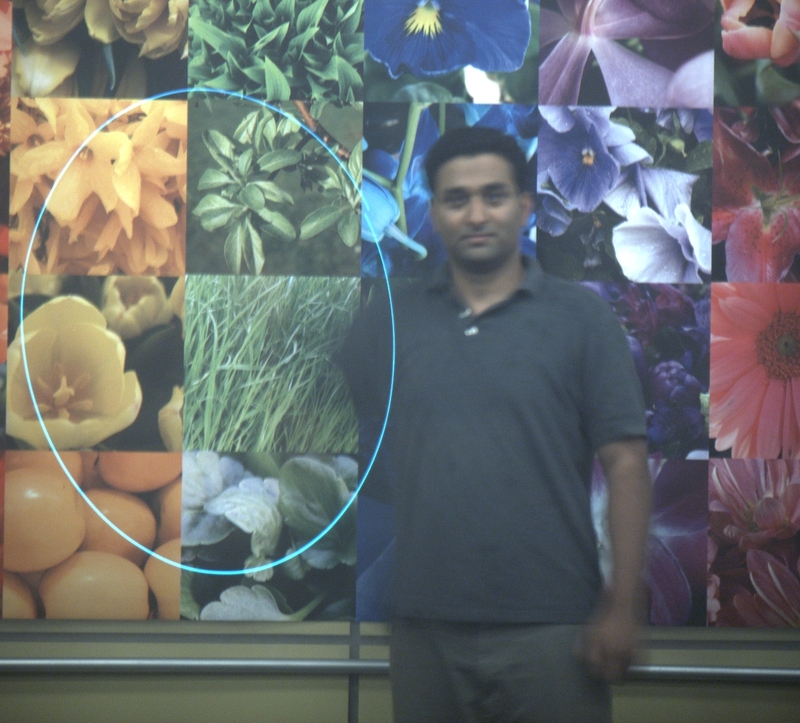 We demonstrate that manually-specified point spread functions are sufficient for several challenging cases of motion-blur removal including extremely large motions, textured backgrounds and partial occluders. Top left shows image of a fast moving taxi captured using our new camera. Bottom left shows the rectified image to make motion lines parallel to scan lines. An approximate cutout of the blurred object is shown in top right. 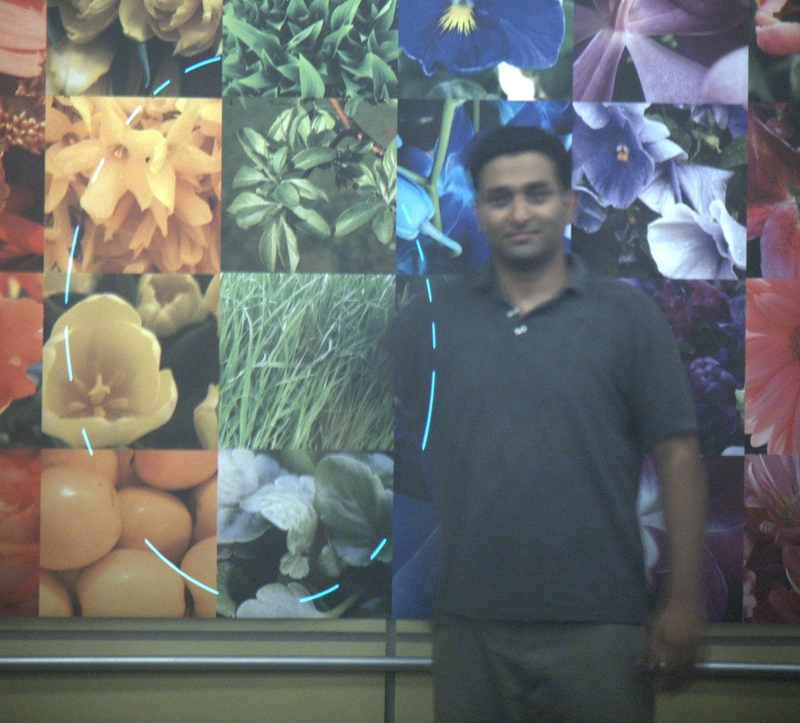 The deblurred image obtained by solving a linear system is shown in bottom right. Note that all high frequencies are recovered and there are no deconvolution artifacts. Motion deblurring is an ill-posed problem. 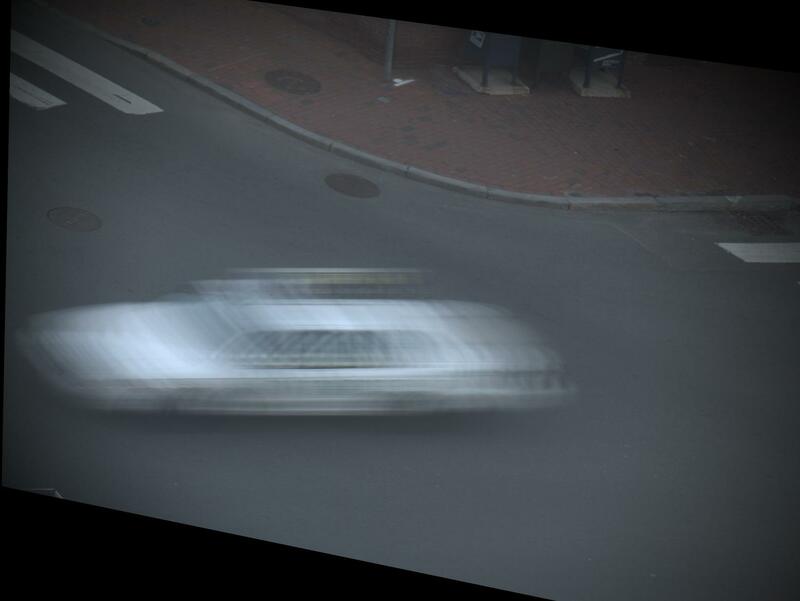 The relative motion between camera and the scene results in a blurred image in which high frequencies are lost, due to which deblurring results in increased noise, ringing and other artifacts. Note that this is independent of the deblurring algorithm used. As soon as the image is captured, high frequencies are lost and the damage is done. 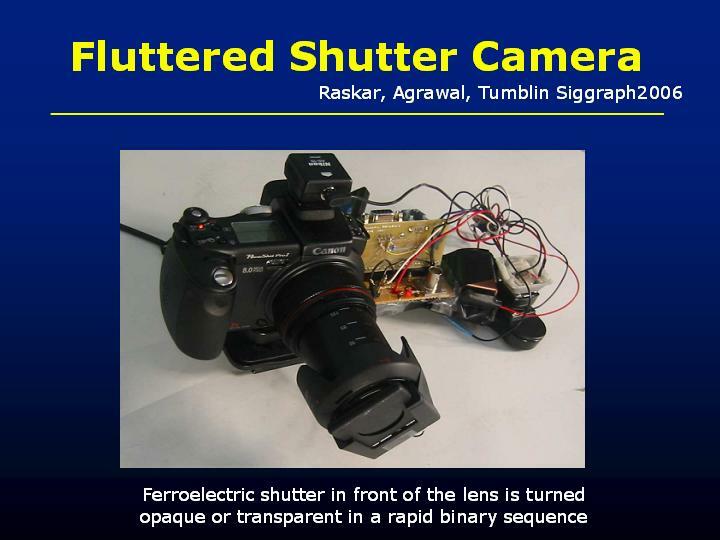 In this paper, we propose a novel coded exposure camera and show that by fluttering the shutter in a single exposure, one can retain high frequencies. The deblurring then become a well-posed problem. Our approach is thus fundamentally different from other deblurring algorithms. In fact, we use the simplest possible deconvolution approach: solving a linear system AX=B to recover the sharp image X from the blurred image B and show high quality results with large motion blurs (~300 pixels) with no ringing and deconvolution artifacts. The change in hardware amounts to putting an external ferro-electric shutter in front of the lens, synchronized with the start of the exposure time and can be done on any off the shelf digital camera.